Compressed air plays a critical role in many industrial activities, and is often referred to as the 4th Utility. Whenever your machine is down for repair or maintenance, or when plant production demands more air than you have, HTE Rental Services can help you maintain your production numbers with our 24/7 support and on-site emergency service by factory trained technicians. We have a large selection of rental air compressors including electric and diesel machines. We have everything you’ll need for your air compressor rental to generate clean, dry, compressed air with an electric rental compressor, including air compressors, air dryers, coolers, cables, hoses, fittings, and receivers. Electric rental compressors from 440CFM to 1600CFM are available, each with a matching rental air dryer if required. Be sure to discuss your available breaker size with your HTE Rental Services representative before signing an equipment rental contract. For applications requiring dry air, our after-cooled machines, air dryers, and filter sets ensure that you receive the quality you require at the pressure you need. Do you need a towable compressor? We have a selection of large diesel compressors in both Tier III and Tier IV configurations. 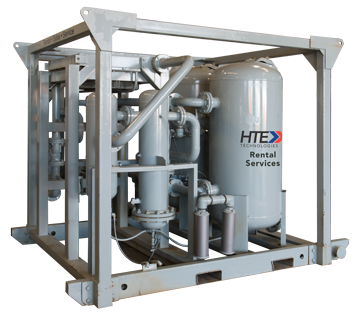 HTE Rental Services supplies heavy duty industrial compressor equipment to businesses.